1. Preheat the oven to 220°C, gas mark 7. Place the fennel and cauliflower in a large roasting tin. Scatter over the capers and pour over the wine. Cover the tin tightly with foil and bake for 30 minutes until the vegetables are tender. 2. Preheat the grill to medium. Score the skin of each fillet 2-3 times. 3. Remove the foil from the roasting tin and arrange the lemon slices and bay leaves on top of the vegetables. Lay the fish fillets, skin-side up, on top of the lemon and spray lightly with oil. Grill for 7-8 minutes until the fish is golden and cooked through and the vegetables are lightly browned. Serve with the rice. 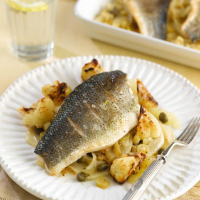 The combination of fennel, cauliflower and capers makes for a lovely accompaniment to the delicate flavour of sea bass. Try this recipe with other white fish such as plaice or sea bream.